This idea came to me as I was looking at a booklet, compiled by my dad, containing photos of and information about a great-uncle who was killed as a fighter pilot in WWII. In my packrat family, it is not unusual for someone to save postcards dated November 1942, and my dad has one from his uncle, sent from pilot training in Arizona. On the front of the postcard is a photo of the airfield, and on the back my uncle writes to my (then 7-year-old) father about how much fun the planes are to fly. Front of card: A view of Menegroth, with the pillars, fountains of marble, many-colored stone floors, carved beasts and birds, nightengales flitting about. Thanks so much for the pearls you sent from the Isle of Balar. The little stunted guys went wild for the things, especially that huge one--Nimphelos (sp.)? Look at the mansions they devised from stone! I call it Menegroth, the Thousand Caves. Come visit, we have plenty of guest rooms. Front of Card: A picture of the Firth of Drengist. Front of Card: An artistic shot of a young and nubile wild mortal woman, clad in only her hair, frolicking in the forests of Hithlum as deer watch on in fascination. Front of Card: Sepia photograph of menacing looking trees packed tightly together. One can just make out a small path intersecting the picture, and a hint of cobwebs in the corner. Greetings from Mirkwood! is displayed in a happy font over the top. Confusticate you Wizards! You just knew something would go wrong as soon as you left me alone with those confounded Dwarves. I feel like some slimey disgusting creature who lurks about in caves under mountains. Don't bother writing back, we'll have all rotten in barrels by then. I believe it is Saeros. Thanks for the tip. Have you a postcard to contribute? Message: Hey dad, you might wanna watch out. Melkor is on the loose and I just overheard that he may be after my preciousss.....I MEAN....my silmarils! So be very careful! Mom and I are well. It's quite peaceful here on the open sea. Her arm's on the mend after the long swim, and I think the salt air has been really good for my skin. Now that the Silmaril is up and running, we should have a better course charted for the West. Will write again when we get to Uncle Finarfin's. Keep to your studies, listen to what Master Cirdan tells you, and don't wander too far from home. ps: If your cousins Maedhros and Maglor drop by, tell them we left on a family visit and should be back by the end of the month. Front of Card: A picture of the Second Party Tree, the mallorn, at sunset. Message: Dearest Uncle Will, We have a little change of plans. I know I said that we would be coming for a visit this Spring, but it seems that I am pregnant... again. I know, I know! This is number 12. Sam says that he wants a big family... but enough is enough. Do you know any doctors in your area that can perform a vasectomy? P.S. Sam, Frodo Jr, Rose Jr, Merry Jr, Pippin Jr, Goldilocks, Hamfast Jr, Daisy, Primrose, Bilbo Jr and Ruby send their love. Front of Card: A view of the newly-refurbished Chamber of Mazarbul, with Balin's seat, mining tools, and mithril ore. Message: We've really fixed up the old place, have tons of stuff to sell on Dwarven Antiques Roadshow. Found a vein of mithril, too, so we shall be as rich as that old scalebag Smaug. Singo! I should think that Rosie would never write such personal, private information on a postcard!! You know how nosey those dang Hobbits are! News has reached me that some redneck and his Elven groupie managed to take one of the you-know-what's from you-know-who. You can't begin to imagine my disappointment in you. As my sons, my heirs, I expected more from you. But to allow a man to accomplish what you have sworn to do is an utter disgrace to the family. ps: Send magazines -- Popular Mechanics, Economist. Front of Card : A map with no markings. Message : Hey pop, me and mom are heading back to her home in the hidden city of Gondolin. Good luck finding us. Hope the map helps. P.S. I always did like mom better. Yes, I know Tuor didn't know Maeglin at this time, but it was too funny to pass up. Front of Card: black with a grey official stamp. Front of card: A view of Old Man Willow swaying peacefully over an idyllic stream. When I said that I had not spoken with Tom Bombadil for some time and that I might like to visit, were you too busy eating purloined mushrooms from Farmer Maggot to do as any true friend might? You well know my memory is not what it once used to be. Why did you think we sat for hours in the desperate cold before the gates of Moria because I fancied some fresh air and hoped for a glimpse of the creature in the pool? I had forgotten Old Father's relentless singing and recall now, far too late mind you, why I had taken such an extended absense from his company. Furthermore, the Old Forest refuses to grant me escape. I think Goldberry is behind that. Not that I can blame the fair lady. Eternity cooped up with a singing village idiot with bright yellow boots can't be an easy fate to bear alone. I shan't forget this, Frodo Baggins! My long passed threat to Sam was not an idle one. If you wake one morning feeling distinctly toadish, you shall know its source and had best ensure your garden is free of the snakes that Sam was so perturbed about on that sunny morning. If your letter box explodes in a bright cackle of sparks and whistles, as if a fire cracker had been stuffed in it, you shall know that I have managed to escape this madman here and am presently on my way to find you. P.S. Do you have any Old Toby Leaf? If you sent me some it would certainly help soothe my wizardly wrath. Send it care of Old Father Bombadil. You know the address. How are you all? Hope you're all well. Look I know I went a little over the top but surely even you boring dudes have seen the joke by now. Anyway, any chance I might visit? cause I'm stuck out here with Sauron and he's a load of no fun I can tell you. P.S. Have you still got my music collection? Front of Card: A picturesque view of Parth Galen, with drawn on black-feathered arrows at each of the corners. To: Denethor, Lord of Minas Tirith. Message: Father, my profound apologies for not getting back to you sooner. 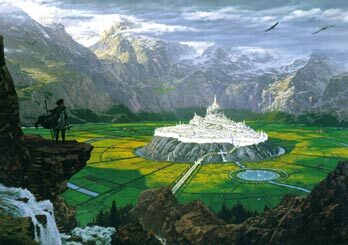 After my last postcard from Rivendell, the journey has taken much longer to return, and the people I’ve been with had dilly-dallied much. Our leader died, too, so that was a great loss. E: apologies to literate orcs. Front of Card: Amon Lanc rising out of southern Mirkwood. Message: Dear son, How are you doing? I hope that everything is going well in Ered Luin. After much wandering we have arrived in southern Mirkwood and I have found a hill that looks promising. My companions don't think so, but the ring on my finger tells me that there's mithril in that hill! We've noticed quite an imposing and dark castle on top of the hill. I have finally convinced my companions that the best course of action is just to go up and knock on the gates and ask if we can start digging. I'm sure we will have to agree to give them 20% of the profits or whatever is customary in this part of the world. Oh well, there's always a catch. Ha, ha! Wish me luck! Message: Your dry cleaning is ready for pick up. We hope you are satisfied with our services. Please recommend us to your friends! Front of Card: Opened gate of Moria. everything is going just fine up here, you have nothing to worry about. As you can see Tilion is again in that mood,but I am speeding up to avoid it. PS Morgoth is a very shy guy by the way, nothing like you guys said, each time I drive by him he tries to find a place to hide .... such a sweet guy.